Local to me, Grimo Nut Nursery is home to the heartnut, a member of the walnut family fashioned in a heart shape. Heartnuts have a smooth, creamy texture with a flavor similar to a cross between walnuts and cashews, and an impressive nutritional profile, too. They have twice the fibre of walnuts, are rich in omega 3 and 6 fatty acids, and are recognized for their role in heart health. Here, smooth, silky pesto is laced with basil, a touch of garlic, and the unique flavor of toasted heart nuts. Serve as desired, such as with your favourite whole grain pasta, in lieu of pizza sauce, or stirred into mashed potatoes. Put the basil leaves, heart nuts, water, lemon juice, garlic, and salt in a food processor. Process until smooth, turning off and scraping down the sides as necessary with a rubber spatula. With the food processor running, slowly stream in the olive oil, continuing to process until completely smooth. Adjust salt to taste. Beets — ever had them raw? They’re a match made in food heaven with bright orange, pungent ginger, and salty roasted pistachios. This is excellent as a salad, but great as a slaw on sandwiches, too. 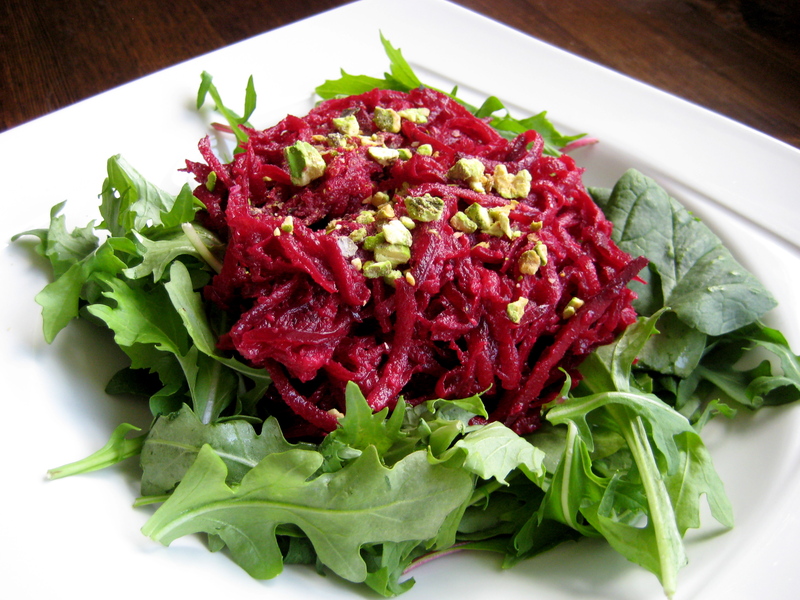 To grate the beets, use a box grater or the attachment on your food processor. Place the ginger, half of the shallot, the orange juice, olive oil, juice from half the lemon and a sprinkle of salt into a heavy duty food processor. Process until smooth. Taste for seasonings, adding additional shallot, lemon juice and salt if necessary. I love using a whole shallot, but for some it may be too strong. Toss the mixture with the beets. Refrigerate for at least 2 hours. Before serving, sample the mixture again for taste, adding more lemon or salt if necessary. Either toss the mixture with the greens or place the greens in a serving bowl and top with the beet mixture. Sprinkle with pistachios. Serve immediately.